Well, it’s hard to believe that June is already here! May ended up proving to be one of the most beautiful months that we’ve seen all year. From steady temps in the 70’s, flat water on the salt, stunning vistas high in the mountains, epic sunrises and breathtaking sunsets… it sure was a doozy! When you take the drive from The Kenai, Alaska’s Playground up north towards Anchorage, it’s impossible not to stop at Six Mile Creek to splash your toes in the water, especially on the most perfect sunshiny Alaska day. Lower Summit Lake is an excellent place to go birding, wildlife viewing or just stop and soak in the incredible photography opportunities. Somewhere deep into the backcountry way above the Kenai River is a mountainous view that is sure to blow you away. If you look close enough, you can even see the Kenai River peeping through at the very bottom of the mountains. The boat harbor on the Homer Spit is surely filled with more fish stories than we could even imagine. And it sure is beautiful! The view from the deck at the Kenai Princess Wilderness Lodge overlooking the Kenai River is absolutely spectacular. When we visited Jim’s Landing off Skilak Lake loop this May, we noticed that there were some pretty impressive rock stacks all over the shore. The turquoise blue water at the Russian River ferry is always an enchanting sight to behold during the springtime months. On May 3rd you could catch a sunrise around 6:30am and it certainly made getting out of bed a whole heck of a lot easier. But these days you have to get up around 4am to be fortunate enough to catch the sunrise. But when you do, the stunning beauty makes it so that you don’t regret the lack of sleep one bit! And sunsets (which are equally as breathtaking) won’t come around until nearly midnight. But when you’re feeling up to it, they sure are worth staying up late for. This one below is overlooking Cook Inlet from a secluded trail in Alaska’s Kenai River City of Soldotna. The lifejackets are out and ready for the season at Bings Landing. Remember, kids don’t float! This picture has us convinced that Kenai Lake might be a magical place that comes straight out of our dreams. Simply stunning! Halibut Cove was beaming with bright blue skies, tents on the beach and snow-capped mountains this May. This little place is truly so special. If you ever get the chance to visit, DO! You won’t regret one second of it. A little place called Cooper Lake is the perfect spot to go if you want to get away from the crowds but still enjoy epic fly fishing and mountain views. The turquoise water of the Kenai River is the definition of “eye candy” in the springtime. Especially when the leaves are starting to turn colors and develop more life and there is still leftover snow on the mountains from the winter months. These two factors really make that turquoise water POP all that more clearly. The view from the pullout going into Homer always seems to knock us off of our feet. With the spit in the distance and mountains for days, it’s easy to fall head-over-heels in love. Going springtime mudding down one of many trails on The Kenai, Alaska’s Playground is the perfect way to dust the cobwebs off the ATVs and prepare for an awesome summer of riding and exploring the great outdoors. I think we can all agree on one things… No matter what, there are no bad days when you’re out on the salt! Cheers to another amazing month down, friends! We hope you all enjoyed your month of May as much as we did and we look forward to the most epic month of June in The Kenai, Alaska’s Playground history. 😉 Be safe out there and as always, have FUN! All photos in this post are copyright of Loomis Sage Marketing with sole usage rights granted to the Kenai Peninsula Tourism Marketing Council. The three day weekend is right around the corner, and in addition to President’s Day on Monday… don’t forget that it’s Valentines Day on Sunday, February 14, 2016! Which means you have the perfect excuse to spend the whole day celebrating life, love and happiness with your special sweetheart or with those friends and family members that are near and dear to your heart. Maybe you aren’t someone who necessarily cares for the Valentines Day holiday? We get it. The infamous flowers, chocolates and life-sized stuffed animal “hoopla” that surrounds us all for weeks leading up to the holiday can be a bit too much to handle. Fear not… you’re in luck! We have some great alternative options for those of you wanting to celebrate LOVE this Sunday while still enjoying The Kenai, Alaska’s Playground and supporting local businesses. First things first; seize every moment of this long weekend. You know you’ll regret it if you don’t. So get up early and chase a sunrise. Your eyes will thank you, we promise. If you’re like us, and you want to start the weekend off on Friday or Saturday with a yummy breakfast treat, it is always a satisfying experience when stopping into Veronicas Coffee House in Kenai, Alaska. Serving delicious baked goods, fresh coffee and an assortment of menu options, Veronicas Coffee House offers the perfect Alaskan charm and warm hospitality to get your love-filled weekend started off right. Its also a great place to bring the whole family or to meet up with old friends. If you want to get out of town and into the backcountry, snowshoeing is always a great way to spend quality time with the one or one(s) you love. And on Alaska’s Playground, we truly do have an unlimited amount of backcountry to explore. Cross country skiing is another great way to get a great workout together while also enjoying the fresh air and natural beauty that Alaska’s Playground has to offer. Horseback riding is always a fun activity to get you out of town and exploring nature with your sweetheart, the kiddos or a group of your closest friends. Alaskan Horseman Trail Adventures and Guest Ranch in Cooper Landing, Alaska is a great option for anyone wanting a true taste of fresh winter air and views that are bound to take your breath away. If you have a need for speed and enjoy a good adrenaline rush, maybe snow-machining is the perfect activity for you and your special somebody to celebrate Valentines Day this Sunday. On The Kenai, Alaska’s Playground, you are always guaranteed incredible vistas no matter which direction you head. And if snow-machining is what you choose and you happen to head south, our friends at Freddie’s Roadhouse located in the Caribou Hills in Ninilchik, Alaska offer excellent backcountry accommodations for all outdoorsy enthusiasts. If rustic lodging and a true Alaskan experience is what you are after this weekend, this is a great option for you! Another way to enjoy an adrenaline-packed weekend together is by heading to Girdwood, Alaska to visit the infamous Alyeska Resort. Great for snowboarding, downhill skiing, dining, live music and loads of fun for all ages. Oh, and the sunsets and sunrises seem to be notoriously amazing at Alyeska Resort as well. You really can’t go wrong when heading to this magical place for a weekend. Photo from last Valentines Day 2015 at Alyeska Resort. Chasing a sunset via ATV ride is a great way to spend quality time together this Valentines Day. The photo below was taken in Homer, Alaska off East End Road. God’s country at it’s finest! Photo from Loomis Sage Marketing. If you are in the market for a romantic getaway this weekend, head to the lovely town of Seward, Alaska and check out the spectacular A Cabin on the Cliff. This is a rustic trappers cabin that has been refurbished to offer romantic elegance. Here you can enjoy spectacular views of Ressurection Bay and the Chugach Mountains from a private hot tub located on a large, spacious deck. Another place to enjoy a quite, secluded romantic getaway is the beautiful Escape for Two B&B Cabin Rentals in Soldotna, Alaska. Have a fire, relax in the hot tub or just get cozy indoors and enjoy a glass of wine. You will feel utterly relaxed from the moment you check in. Enjoying a glass of wine together and some local Alaskan chocolates is a cliché Valentines Day option, but hey… you have to admit that it sounds like a pretty incredible idea. And when you visit Bear Creek Winery & Lodging in Homer, Alaska- you will feel anything but cliché. This place is miraculous! Bear Creek is a country winery. They make fruit wines and fruit grape wine blends. They grow, pick, and process some of the best berries in the world and it shows in their hand crafted, award winning wines. Guests are invited to visit the wine tasting room, tour the facility, walk the gardens and take in the breathtaking views of Kachemak Bay. The winery also offers high-end lodging for those visitors looking for a relaxing and romantic getaway. If fine dining is what you are after, Hotel Seward in Seward, Alaska is proven to be an excellent option. Offering steak, fresh Alaskan seafood and a plethora of other options. Check the Hotel Seward menu out HERE and prepare to have your mouth start watering. Mykel’s Restaurant in Soldotna, Alaska is another great option if you are after a delicious meal this Valentines Day weekend. We’ve heard through the grapevine that they’ve whipped up a special heart-melting menu for this weekend, so don’t miss out. Check their menu out HERE and be sure to call and make your reservations now. Remember, the way to anyone’s heart is through their stomach. And if you’re spending time with the kiddos this Valentines Day weekend, we have a couple great ideas that sure to bring a plethora of smiles. The Alaska Wildlife Conservation Center near the town of Girdwood, Alaska is dedicated to conservation, education, and quality animal care of Alaska’s wildlife. Open currently on weekends only, come view Alaskan wildlife in large natural enclosures, which allow the wildlife the ability to display their natural behaviors. The Alaska Sealife Center in Seward, Alaska is always fun for kids and adults of all ages. Spend the day viewing beautiful marine life with the indoor comfort of being nice and cozy. Or if you want to bundle the kiddos up and take them outside for a fun, winter-wonderland adventure, sledding is always a great idea that will bring adorable pink cheeks and smiles from ear to ear. You can even bring your beloved four-legged family members to join in on a day of fun in the great outdoors. Need more ideas for how to make your Valentines Day weekend memorable? Submit a response or question below. Remember that you can always call us at (907) 262-5229 or visit us online at http://www.kenaipeninsula.org. Wishing you all a wonderful, love-filled weekend on The Kenai, Alaska’s Playground! 10 THINGS TO DO ON THE KENAI! Get ready for your visit by browsing the many attractions the Kenai Peninsula offers! Whether catching wildlife in your camera, on a hook, or in your memories, the Kenai is sure to meet your adventurous needs. The Kenai Peninsula Borough is 90% wilderness and therefore a destination of choice for Alaskan travelers who desire to observe wildlife within its natural habitat. We serve as the gateway for Alaska’s best one-day flightseeing trips to view the famed Katmai and Wolverine Creek bears. The Kenai is home to one black bear per square mile. Black or brown bears may be spotted from your vehicle, from your raft as you float by, or up on the mountainside while hiking our miles of improved trails. The Kenai’s coast is one of Alaska’s prime viewing areas for marine wildlife. Kenai Fjords is certainly a mecca for marine wildlife watchers, as is Kachemak Bay. Birding is world class, and many travelers time their visit to witness some of nature’s special events: the migration of shorebirds in Homer or the gathering of snow geese on the Kenai River flats. Did we mention moose? Formerly known as the Kenai National Moose Range, the Kenai National Wildlife Refuge is a sanctuary that comprises approximately a third of the peninsula and provides an ideal haven for moose, lynx, wolves, dall sheep, caribou, fox, coyotes and more. The Kenai has a wide array of easily accessible seashores, rivers, creeks, lakes, marshes and alpine country which make for some truly exceptional birding. We are accessible by road (private and group charters readily available for more remote destinations), have all the modern amenities, yet can offer birding in a truly beautiful wilderness setting. There are 469 species of birds documented in Alaska, plus more than 30 other species reported but not verified, and most can be found right here. The surprising turquoise color of many of The Kenai’s rivers and lakes is very unusual and is caused by just the right blending of glacial waters and snowmelt. Home to spawning salmon, these rivers and lakes can be explored by rafting, fishing from drift or powerboats, or finding beautiful trails along the shores. Some of Alaska’s wildest whitewater, as well as some of its most placid and scenic waterways, can be found on The Kenai. The quaint settlements of Moose Pass and Cooper Landing, along with the larger communities of Sterling, Soldotna, and Kenai, owe a substantial portion of their livelihoods to the bounty of fish, scenery, and wildlife that the Kenai watershed provides. Over the eons, glacier ice has carved valleys that are now submerged under seawater, thus forming the fjords. Kenai Fjords National Park preserves this magical part of the Peninsula, and a diverse fleet of small ships delivers the experience. The Kenai Fjords offers more than majestic scenery—few places in the world can boast of the stunning concentrations of wildlife viewed on a daily basis in the Kenai Fjords and the adjoining islands of the Maritime National Wildlife Refuge: sea otters, puffins, sea lions, kittiwakes, humpback and orca whales, harbor seals, oyster catchers and more. Glaciers are still making their way down from the ice fields, and witnessing the calving of huge chunks of ice from the glacier’s face as it meets the sea reminds us that the Kenai Fjords are still under construction. There aren’t many places in the world where you can gaze upon four active volcanoes from one stretch of beautiful highway. From north to south, Mt. Spurr, Mt. Redoubt, Mt. Illiamna and St. Augustine all may be viewed from the western shore of the Kenai Peninsula, out across Cook Inlet to the Alaska Peninsula. The volcano coast isn’t the only scenic drive on the Peninsula…one would have a hard time choosing a favorite stretch of road—there are dramatic vistas and spectacular scenery from one community to the next. Mountains connect The Kenai to the rest of Alaska, and mountains link the regions of The Kenai together. They form the setting, the backdrop, or the stunning scenery on the horizon. They span The Kenai’s four major protected areas: Chugach National Forest, Kenai Fjords National Park, Kenai National Wildlife Refuge, and Kachemak Bay State Park. These mountains hold a contiguous ice field that is larger than the state of Rhode Island, is a half-mile deep, and is reachable by an adventuresome trail or two. They are the most accessible mountains in the state; with more than 433 miles of improved trails to help you find your own private mountain paradise for your day hike, backpacking trip, or leisurely walk. The town of Seward is the launching point for a number of different glacier trips ranging from a short tour around Resurrection Bay to an all day excursion into Aialik Bay or Northwestern Fjord. Homer also offers a number of wildlife cruises in Kachemak Bay State Park. Remember that while you will be enjoying glacial views from the comfort of the boat cabin, the closer you get to the glaciers the more the temperature drops, so dress in warm layers. The Kenai is well known for the extensive camping opportunities available along its road system. Numerous public campgrounds are located within the Chugach National Forest, the Kenai National Wildlife Refuge, Alaska State Parks unit, and within municipal areas of Seward, Soldotna, Kenai, and Homer. Flightseeing takes many forms on The Kenai, it can be enjoyed from airplanes, seaplanes, ski-planes, and helicopters. You can enjoy the spectacular scenery from the air as you fly over Kenai Fjords National Park, Lake Clark National Park, the Chugach National Forest or even Kachemak Bay State Park. Or you can land for an up close and personal look at a glacier, a volcano, or bears and other wildlife. It can also be your ticket to accessing remote fishing areas and hiking trails. The Kenai River has many public access sites and private businesses along its shores in the Sterling-Soldotna-Kenai area offering bank angling access during the popular salmon runs. Many of the popular bank angling access sites offer “habitat friendly” facilities designed to protect important fish habitat. Elevated walkways, stairways into the river and other methods protect valuable vegetation important for healthy fish habitat, ensuring that the popular runs of salmon can continue. Crooked Creek & The Kasilof River offers bank angling at the confluence and is one of The Kenai’s most popular and productive locations for king salmon fishing from shore. With kings ranging in size from about 20-40 pounds, they are more than a handful on rod and reel from the shore! Deep Creek, Ninilchik River, & Anchor River all give great results. Bank angling on Deep Creek, the Ninilchik River and the Anchor River are all popular springtime pursuits for anglers targeting early kings. Check the fishing regulations, as these rivers are only open for fishing on certain weekends. Charter Opportunities exist for fishing enthusiasts interested in rainbow and/or salmon fishing of the Kenai or Kasilof Rivers, while an extensive charter industry is available to offer halibut fishing and/or salmon fishing near the communities of Seward, Ninilchik, Anchor Point, and Homer. Fish, Fish, fish! And why, why, why? Because location, location, location! The Kenai is world renowned for its wide-ranging fishing opportunities. Four species of salmon by the hundreds of thousands—find their way into the Peninsula’s bays, rivers, and lakes to return to where their lives began. Virtually any time of the summer is salmon fishing season on The Kenai. The largest King Salmon of all, weighing close to 100 pounds, are sought on the famed lower Kenai River. Salmon is only part of the draw. Most seacoast towns on The Kenai offer charter fishing for halibut and other saltwater species. 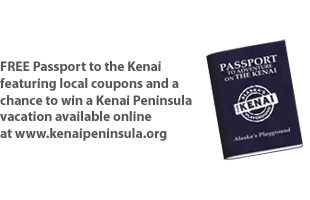 CLICK HERE TO LEARN MORE ABOUT THE MANY ATTRACTIONS ON THE KENAI!